Black Belt Pledge --- I hold that my time and my skill are the assets of my profession, assets which grow in value as I progress in the Art, until as, as a Third Degree Black Belt, I stand as a fully qualified instructor. It shall also be my responsibility to protect any student from ravenous individuals who would try to take advantage of personal weakness to divest the gullible into unprofitable paths, to preserve the sacred things, God, family, country, and Association, I pledge my all. I tested for my 3rd Degree in July of 1990. It was the last time I was to see Ed Parker, the Father of American Karate, alive. From just before Christmas that year, after his passing, I set myself a goal to find out what the phrase, “fully qualified instructor” really meant. I stopped competing. I would not concern myself with any external aspect of the Art (trophies, further progression in rank, etc. ), until I understood. I spent lots of time “getting my stuff”. Refining technique extensions, Long Form 7, working with blades, etc., took much of my time. I worked on projects, whether Formulations, revisions of terminology, groundwork, or publishing articles, I stayed busy working on the Art physically and conceptually. I worked on the International Karate Championships. I did everything from center referee to truck loader, T-shirt folder, Stage Director, even Master of Ceremonies. I built a successful Karate business in New Orleans. 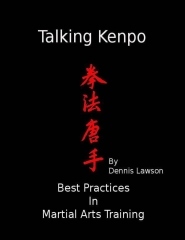 I taught seminars at Gatherings and other venues throughout the U.S. I taught seminars in Europe and worked on the European Championships. I got “out of shape” and “in shape” again. I organized testing boards, functioned as an organization’s representative. I tested long-time students for black belt. "If what you did yesterday seems big, you haven't done anything today."